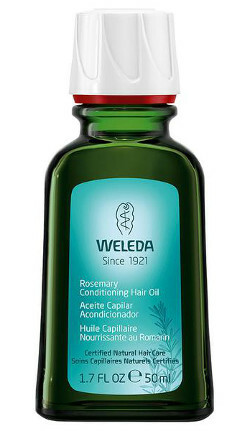 Dull hair in need of repair gets intensive nourishment with Weleda Rosemary Conditioning Hair Oil. This deep-conditioning treatment restores moisture, softens split ends and adds radiant shine as it penetrates. Organic rosemary leaf extract helps strengthen dry, damaged hair, while organic burdock root extract revitalizes and nourishes hair and scalp. Use daily or as needed for softer, smoother, more manageable hair from root to tip. Ingredients: Arachis Hypogaea (Peanut) Oil, Trifolium Pratense (Clover) Flower Extract, Fragrance (Parfum)*, Arctium Lappa (Burdock) Root Extract, Linalool*, Geraniol*, Coumarin*, Limonene* (component of Rosemary Leaf Oil). *from natural essential oils.